Excellent customer service, very prompt and fair on pricing. I will continue to use use R and G hauling in the future. Great company ! I've used them several times. They have a complete knowledge of hauling down to a science. With out question I would recommend this great company. . I have used Robbie at R & G Hauling. He was always on time courteous and does a great job. I have and will not hesitate to recommend him to family and friends. This review is so overdue! I've been using Rob for over twenty years now for all our moving and hauling jobs. The fact that he has been doing jobs for us this long...should speak volumes! The positives: Rob is always professional, prompt and positive. The negatives: There are none! I work for someone who owns a Hollywood studio and a large estate, so there have been numerous different projects that I have given to R & G Hauling over the years. Every time I've called....he has always shown up on time, worked hard and quickly and made both of us feel good about the price of each job. Bottom line...I wouldn't think of using any other company! 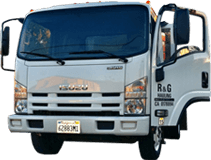 R&G Hauling is a great company and I would definitely recommend them to anyone. Rob is friendly, courteous, and very helpful. He helped to demolish and remove an old tool shed from our backyard. He was very quick and efficient. He had that shed removed in no time. I wouldn't hesitate to call upon him again in the future for any hauling and demo work. Thanks R&G!! I wouldn't even think of calling another company, these guys are the best. Very professional. They were doing a job for me and when it came to be lunch time, they asked me if they could bring me back something to eat and said it was on them, super friendly. Rob is top notch! A true professional at his craft. He makes hauling and clean up an art. Extremely tidy and always punctual. Fair pricing and he goes above and beyond. I've used him for over many years. As a general contractor for over 25 years, this kind of consistent service is invaluable to me. I use R and G because I trust in knowing the job will be done right every time.